Be prepared, you’re about to see red tonight, October 8! No, there’s no problem – in fact it’s just the opposite. Get set for an astronomical experience like no other right across Australia. Everyone’s talking about it. We’re going to be treated to a total lunar eclipse with the Moon expected to take on an eerie ‘reddish glow. 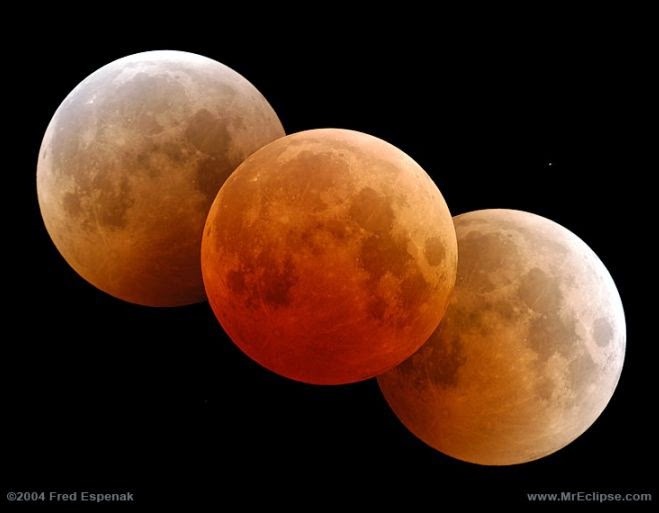 Lunar eclipses are one of the most spectacular sights in astronomy and one not to be missed. They occur when Earth passes between the Sun and the Moon, casting our shadow onto the Moon’s surface. The most impressive part starts when the Moon enters the earth’s shadow, and the eclipse begins. Over the next hour or so, the Moon will start to change colour. We’ll get a good view across the east coast of Australia. The Moon will start to move into the Earth’s shadow a little after 8.20pm with totality, or maximum eclipse, at 9.55pm. On the west coast start looking at 6.25pm for definite changes in colour as the moon is rising, but don’t go anywhere, the best is yet to come. Totality or maximum eclipse occurs at 6.54pm. What a photo opportunity! Those with a smart phone can attach it to their home telescopes for an unusual souvenir. Tripod mounted is the best of course with a telephoto lens to ensure a top image. As the eclipse progresses, the Moon’s disc takes on its eerie coppery red glow. This is because sunlight falling on the Moon has been filtered through the earth’s atmosphere. In fact, the Moon can take on a range of colours, anywhere from dark brown and red to bright orange and yellow. The exact appearance depends on how much dust and pollutants are present in the upper atmosphere at the time. If the Earth didn’t have an atmosphere, the Moon would be invisible during a total lunar eclipse because there would be nothing illuminating it. The fully eclipsed Moon won’t be totally dark, and that’s what makes totality delightful. Total eclipses tend to be redder after major volcanic eruptions or major bushfires since these events dump large amounts of volcanic ash into Earth’s atmosphere. Everyone on the planet who can see the Moon will see the eclipse simultaneously. It’s almost a family affair. Although we seldom see it, Earth has a shadow, much like your own – dark inside, pale outside, pointing away from the sun. Earth’s shadow stretches almost a two million kilometres into space, far enough to reach the moon. Astronauts on the Moon would see an amazing sight. They would actually see the Earth eclipsing the Sun! They would see a bright red ring around the Earth as they watched all the sunrises and sunsets happening simultaneously around the world. As with a solar eclipse, lunar eclipses are also deeply rooted in folklore. Australian Aboriginal accounts of lunar and solar eclipses indicate many traditional communities understood the movement of the Sun, Earth and Moon. Many viewed lunar eclipses with fear, associating them with bad omens, evil magic, disease and death. That’s because the reddish colour the Moon takes on during an eclipse is seen in some traditional culture as blood, meaning someone’s dying or in fact has been killed. I get this question often, is it safe? Yep, unlike solar eclipses, lunar eclipses are completely safe to watch. You don’t need any kind of protective filters. It isn’t even necessary to use a telescope. You can watch the lunar eclipse with nothing more than your own two eyes.